On March 24th 2018, we will be hosting our first ever club competition! Entry forms are outside the gym on the desk, pick yours up at your next session! These must be completed and returned with payment by Wednesday 10th January. – Remember, we start back after xmas on the 7th of January after a 2 week break! – We strongly recommend this is done before the Christmas break, so you don’t miss out. 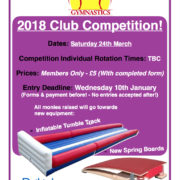 All money raised from the competition will go towards new equipment, in the form of new spring boards which cost around £400 and an inflatable tumble track which costs around £600!! Thank you to those who have already entered, you’re superstars and we’ll see you on the floor! Do you want gymnastics classes at your school but you’re not qualified or confident enough to teach gymnastics? 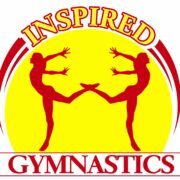 Inspired Gymnastics is here for you! We just need the basic equipment such as benches, tables and mats and we can coach your pupils. 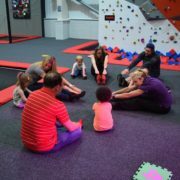 We have highly experienced coaches that will assist you and your children by hosting exciting, fun and safe gymnastics. Gymnastics is one of the most beneficial sports children can take part in. 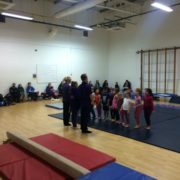 We have been assisting a lot of schools in their gymnastics classes. 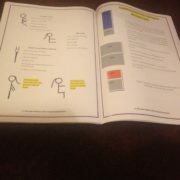 Have a sneak preview inside our resource book for teachers. 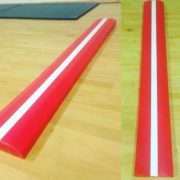 We have a lot of teachers who have expressed their confusion about what to teach in gymnastics at the certain age groups. Our resource book has tools to help with this including a Pupil Guidance Assessment Table, along with sessions plans, equipment layout and pictures for you to follow. 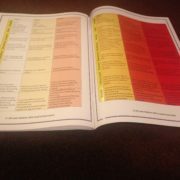 You get one of these fantastic resource books for FREE when we do sessions within your school. They can be bought on our website for £39.99. Please contact jade@inspiredgymnastics.com if your school is interested. Physical education is one of the most favourite subjects for children, all over the world. Why? Because they are free to go around and exert all the energy that they have. It helps them with many foundation skills that can be transferred into other sports but also helps them with self belief, confidence and a sense of achievement. PE teachers are able to play and teach the children at the same time. There are lots of teachers who are scared to teach PE classes because they think they are not equipped to teach the subject. They think that they lack the knowledge required to teach this specific subject. This is where Inspired Gymnastics comes in. 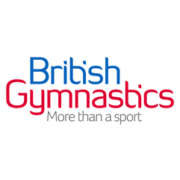 Inspired Gymnastics provides Level 2 Coaches that lead gymnastics sessions or works alongside the teacher. A resource book about gymnastics is ready to be used and added to the curriculum that shows the basic skills that should be taught to all the pupils. There are also more in-depth session plans because of the teachers skills and experiences in teaching gymnastics to children. Teaching physical education classes can be terrifying but given the right resources and funds, handling PE classes will be more attractive effective, and efficient. Each gymnasts competes individually but gymnastics teaches children a lot when it comes to socialization. How does sleeping better affect a child’s social skills? A child that has a good night sleep wakes up with a better mood compared to children who lack sleep. There are lots of things that happen in the gymnastics classes that the gymnasts can apply in real life. An example of this is having to learn to be competitive and sport during competitions. Accepting victory and defeat in life teaches the gymnast that anything can happen but as long as you did your best, defeat is still a success. Aside from that, he learns to rejoice with the success of others. Children nowadays are tied to their gadgets playing games. If a child is enrolled in a gymnastics class, he is able to mingle with children his age. Socialization with people the same age as his help him be confident and gain self-esteem. It also teaches him that other children have feelings and emotions just like him. Working in a team teaches every gymnasts that his effort is needed and appreciated. Just like other team sports, he learns that the team is not complete without him and that his presence is much appreciated. It also teaches a gymnast to be self-efficient. Gymnastics classes allows a gymnast to regularly meet with his coach. Engaging with adults teaches the gymnast discipline, respect and following directions. There are lots of benefits when children are exposed to sports at an early age. Gymnastics is one of the best sports that children can be exposed to. Here are some of the advantages children get when they are enrolled in a gymnastics class. It is important that children develop the habit of exercising. Regular training helps them become physically active and staying fit. children these days must learn to see the importance of taking care of their bodies through exercise. Gymnastics teaches children discipline. This includes attending the regular training where they are being coached properly. 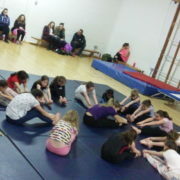 The gymnasts also learn to control themselves and adjust to the corrections that their coaches told them to do so. Children also learn the importance of eating a well-balanced diet daily. Gymnastics help reduce the risk of having osteoporosis because children are being trained on how to maintain good posture at an early age. They also develop strong and healthy bones because of the training that they are going through. Excellent strength-to-weight ratio is one of the things that gymnasts are known for. Having their bodies developed at an early stage is an advantage. Gymnasts are known to train body weight exercises that develop their upper body, lower body, and core strength. These are some of the benefits that children develop when they are enrolled in a gymnastics class. How about your child? Have you considered enrolling them as well? Buy one of our great foam beams soon for £65! Last night we had our first session back after the summer break and the amount of children we had turn up to the classes was Fabulous! It was great to see so many children excited and wanting to take part in gymnastics but also express how inspired they are from the Olympics over the Summer. Thank you parents for your patience last night and thank you to the coaches who worked really hard run the session smoothly. We also had our Invitational only class from 6-7pm for children who are exceeding and progressing fast, these children did amazing last night as they learnt how to condition an stretch their bodies in order to achieve better perfection of skills.